Travelling on GST Road today, there were at least 3 spots where vehicles were stopped and checked at random (nearer Pallavaram Radial road – there were army men with assault rifles involved in the check) – to ensure that money was not getting transported illegally. After Indian Independence in 1947, the existing coinage continued but those were not the days of naya paise but of a monetary system called pies. One Rupee consisted of 192 pies. 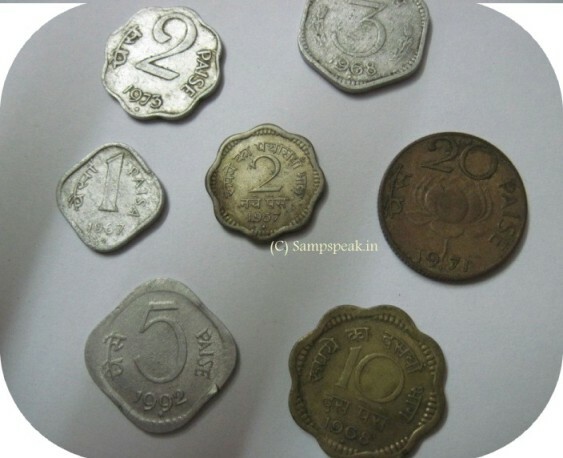 Those were the days of ‘annas’ - Four annas were the equivalent of 25 paise – an anna would be roughly 6 and ¼ paise. The anna system continued till 1957 when India decimalized its currency. Even in the plastic money World where most money-purses weight is due to 5 or more credit / debit cards inside, people do carry money… incidentally, how much of money would you keep always in your purse or in your pocket ? - for the commoners ‘small change’ (சில்லறை)is the big problem. Those of us who utilize public transport; who buy vegetables, groceries, medicines and do other small shopping – for sure have realized this… everytime you conclude your purchase, you would have ran out of change. There are times when people get irritated by the offer of candies, chewing gums and the like – for making up the change. Effective 30th June 2011 - coins of denomination of 25 paise (and below !!) ceased to be of legal tender……. Being Election time, one reads about lot of cash flow … today’s Times of India, Chennai edition reports that ‘money seized in TN touches nearly Rs 100crore’. The report states : With the seizure of `2 crore from the resi dence and premises of Aravakurichi DMK candidate K C Palanisamy and his son K C P Shivaraman in Karur on Wednesday night, the Election Commission has confiscated nearly `100 crore from politicians, businessmen and others since the model code of conduct came into effect in poll-bound Tamil Nadu on March 4. Of this, `37 crore has been returned. “We have so far seized `98 crore from various individuals, businessmen, politicians and others. When proper documents were produced, income tax and revenue department officials returned `37 crore. The rest of the cash seized is in the treasury, and probe is on to find out the source,“ said a senior Election Commission official. On Tuesday night, income tax officials seized `2 crore from the residence and premises of Palanisamy and his son Shivaraman at Chinna Ananda Koil Street in Karur. “Based on a tip, we conducted a raid on the premises and seized the money. Similarly, `2.29 crore was seized from three persons at Vikravandi in Villupuram district.We seized `1.3 crore from Muralidharan Reddiar, `63 lakh from J Srinivasan, a jeweller and `23 lakh from a rice mill,“ said an IT official. The election department has added more surveillance squads to check vehicles as polling day (May 16) nears.“We have increased the total number of flying squads to 6,112 from 468. On Wednesday, we added 5,644 flying squads across all constituencies. The cash seized during this election is unprecedented,“ said the official. Fears of mass money distribution to voters at night during power cuts has prompted the Election Commission to seek a report from the state energy department and the Tamil Nadu Electricity Board on the reasons for outages in certain parts of Chennai on Tuesday night. Political parties, in recent days, had been warning about engineered power cuts across the state to facilitate distribu tion of money by candidates closer to the poll. Chief electoral officer Rajesh Lakhoni said the commission was probing as to whether Tuesday's power cut was one such. If all these are about ‘unaccounted’ black money, now flowing free – here is something peculiarly different – another report in TOI reads – ‘ not allowed extra cash, conductors go hungry’ !!! After a long and hot day aboard an often crowded bus, Metropolitan Transport Corporation conductor S Krishnamurthy does not have enough money to even buy himself a decent meal. That is because of a patently unfair rule that MTC persists with: Conductors cannot carry more than `100 of their own cash. And to even carry that `100, they have to fill a form and obtain permission. A conductor on the Cuddalore-Panruti route lost his job recently after his seniors found that he was carrying `12 in excess of the mandatory sum. A Ayyanar has been without a job for five months after a woman complained to ticket checkers he did not give her a ticket that she paid for. The ticket checkers also found `12 extra in Ayyanar's bag and immediately served him a show-cause notice. This case has made conductors frightful of the possibility that they could forget to take out money that they put in their pockets the previous night. That could mean curtains for them, they say. The rule is especially tough on them in summer, when their vehicles often break down. “We end up on the road for hours under the sun without enough money to buy refreshments,“ said conductor Krishnamurthy who works out of the Tambaram depot. MTC officials say vigil is important or it may encourage corrupt practices and the corporation will also lose revenue. “If we are not vigilant, conductors might take money from passengers but not issue tickets. That could make the corporation suffer huge losses, a ticket checker said. The rule is seemingly ridiculous and not in tune with the changing times ! – there sure are other ways to check corruption.